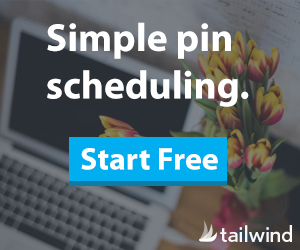 Use Tailwind to schedule your pins on Pinterest and drive traffic to your site. My video tutorial will teach you how to set up your Tailwind account. If you have been following my blog, you know that I believe Pinterest is a powerful social media platform to drive traffic visually to your site or shop. Yet, maintaining another platform is time consuming. I use Tailwind to keep my clients’ Pinterest accounts active. Why should you be using Tailwind? If you’ve read my Getting Started on Pinterest, you’ll know that I highly recommend using Tailwind in your Pinterest Strategy. Using Tailwind to automate a scheduled queue can keep your Pinterest profile active, allowing you to pin fresh content from others (especially through Tailwind Tribes), your evergreen posts, and your new posts all from a friendly and easy-to-manage platform. You’ll have confidence knowing your pins are automatically publishing without active maintenance. Since Pinterest is a highly visual platform, I’ve created videos to help you get started! Ready to sign up for Tailwind? Use my affiliate link and receive a free trial and discount. Have you heard of Tailwind Tribes? I’ve got a whole post dedicated to Tribes. They are a fantastic way to share and find content easily to load to your queue and get your content shared by niche related groups! Are you new to Pinterest and want more tips to get started? See my introductory post Getting Started on Pinterest and don’t forget to sign up for my email newsletter here. You’ll receive my FREE Pinterest Start-up Guide for your creative small business where I give easy actionable steps to getting started on Pinterest!